NEW ORLEANS — Regional Championships Weekend in NCAA Division III Men’s Cross Country has a way of reaffirming what we know or turning that knowledge on its head. But what happens when it does both? That transpired this past weekend as we now know the 32 teams that will be competing for national glory at the 2016 NCAA Division III Cross Country Championships. The most recent National Coaches’ Poll, released Monday by the U.S. Track & Field and Cross Country Coaches Association (USTFCCCA), ranked those 32 teams that earned bids to The Big Dance and only four teams from the previous poll remained in place. North Central (Ill.) is still the unanimous No. 1 and justifiably so. The Cardinals continued their tour de force this past weekend at the Midwest Region Championships where they thumped defending national champion UW-Eau Claire 37-91. This is the sixth time that North Central (Ill.) has been ranked No. 1 in the Pre-Championship Edition of the National Coaches’ Poll. The Cardinals went on to win the NCAA title three times, with their most recent triumph coming in 2014. SUNY Geneseo remained the consensus No. 2 team behind North Central (Ill.) and like the No. 1 squad, captured a region title. The Knights, led by the undefeated Isaac Garcia-Cassani, put five in the top-20 and beat RPI 51-87 in the Atlantic Region. New England Region champ MIT jumped two spots to No. 3, its highest ranking in program history. The Engineers’ top-end depth broke a 110-110 tie with now-No. 5 Williams. MIT’s top-3 runners finished 2-4-13, compared to the Ephs’ 6-12-28. Each of the other five region champs — Claremont-Mudd-Scripps (West), Calvin (Great Lakes), Loras (Central), Johns Hopkins (Mideast) and Christopher Newport (South/Southeast) — moved up in the poll as well. The 7th-ranked Stags couldn’t move up too much in the already crowded top-10, but the Knights, Duhawks, Blue Jays and the Captains climbed two (No. 13 to No. 11), four (No. 16 to No. 12), six (No. 19 to No. 13) and five (No. 28 to No. 23) spots, respectively. Johns Hopkins was the big winner of the weekend as it entered competition ranked 3rd in the Mideast Region, but upset previous-No. 1 Carnegie Mellon and No. 2 Haverford. Though they didn’t win region crowns, runner-ups Occidental (West), Wartburg (Central), Allegheny (Pa.) (Great Lakes) and Washington and Lee (South/Southeast) all improved their positions. The Tigers returned to the poll at No. 16 after not being ranked in Week 7. The Knights jumped 15 spots from No. 32 to a five-year best at No. 17. The Gators leapt 11 spots from No. 30 to No. 19 and the Generals climbed from No. 33 to No. 27. This was the final National Coaches’ Poll of the season as the results from Saturday’s meet will tide us over until next year’s preseason ballot. 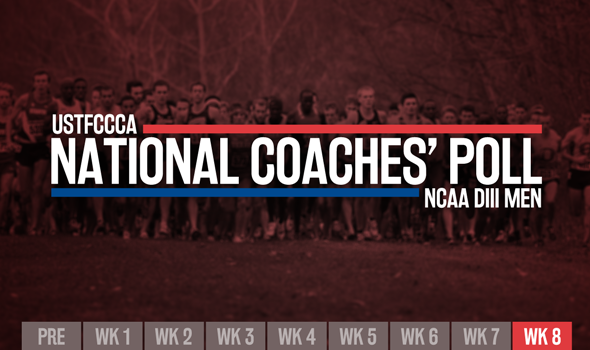 Be sure to check back this week as we preview the 2016 NCAA Division III Cross Country Championships.